How Much Faster Is Konqueror With WebKit? As you can very clearly see, Konqueror with KHTML is more than eight times slower than that with Webkit. Surprisingly Konqueror with WebKit is also faster than Firefox 4.0 Beta 2. The difference does not seem much in the graph above but it is around 400ms which is quite a significant difference if you consider that Konqueror (WebKit) has a total time of around 1000ms. The result here is quite interesting. As expected Konqueror with KHTML does not perform very well, with it failing to cross even 200 in any of the tests. It even failed to complete in the Splay test. The final score of the V8 Benchmark is calculated as a Geometric Mean of all the scores. If we neglect the Splay test, Konqueror with KHTML scores around 70. 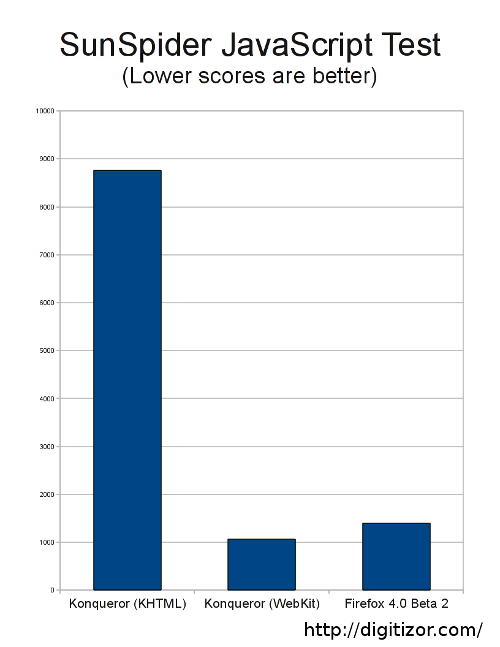 The score that Konqueror got with WebKit is a huge surprise however. It scored over 1100 which is much higher that Firefox 4.0 Beta 2, which managed a score of just below 400. 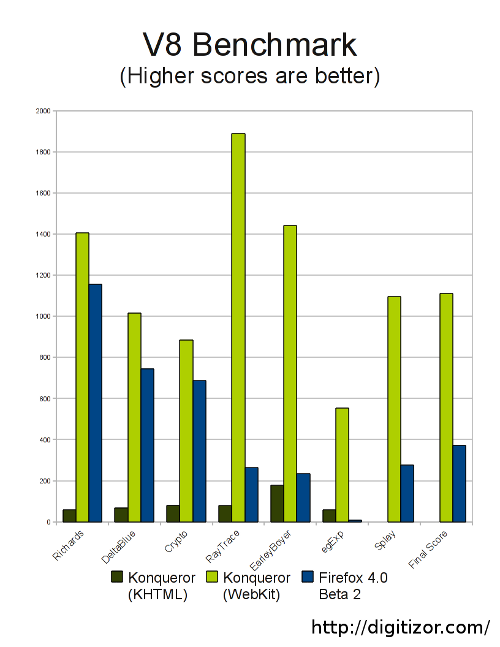 Konqueror with WebKit also managed to score way more than Firefox in every tests. A very impressive performance indeed. So, there you have it you cannot even compare Konqueror (KHTML) with Konqueror (WebKit). The one with WebKit is way faster. Not only is it faster than KHTML, it is also much faster than Firefox 4.0 Beta 2. However, if you are using KHTML in Konqueror, we recommend you switch to WebKit, the difference is just too much.